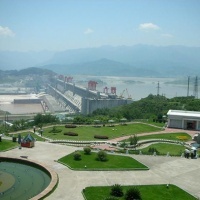 The Three Gorges Dam is a hydroelectric river dam that spans the Yangtze River in Sandouping, Yiling District, Yichang, Hubei, China. It is the world's largest electricity-generating plant of any kind. The dam body was finished in 2006 and all of the originally planned dam components of the project were completed on October 30, 2008, when the 26th generator was brought into commercial operation. Currently, it contains 32 main generators, each with a capacity of 700 MW. An item from the original design yet to be finished is a planned ship lift. Six additional generators in the underground power plant are being installed and are not expected to become fully operational until around 2011. With 2 small generators (50 MW each) to power the plant itself, the total electric generating capacity of the dam will eventually reach 22,500 MW. 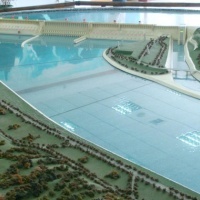 The project produces hydroelectricity, increases the river's navigation capacity, and reduces the potential for floods downstream by providing flood storage space. 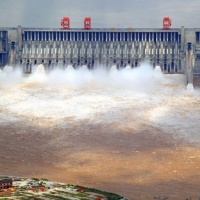 Up to September 2009 the dam has generated 348.4 TWh of electricity, covering more than one third of its project cost. The project management and the Chinese state regard the project as a historic engineering, social and economic success, a breakthrough in the design of large turbines, and a move toward the reduction of greenhouse gas emissions. 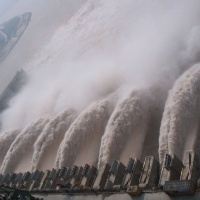 However, the dam has also flooded archaeological and cultural sites and displaced some 1.24 million people, and is causing significant ecological changes, including an increased risk of landslides.The building of the dam has been a controversial topic both in China and abroad.